Great Scott! There’s No Time to Lose! FineScale Modeler and Scale Auto Fans – Start Building Your Very Own Back to the Future DeLorean for Just $1.95 with Free Shipping! $21.80 $1.95 Introductory Offer - 91% off Today! By subscribing today, you will receive the first two issues to begin your DeLorean Build for only $1.95 with FREE shipping and handling. Every month you will receive 4 new issues containing parts and magazines to continue building your DeLorean. You will be automatically charged $10.90 per issue. Shipping and handling will $1.95 per issue. Your total per month will be $51.40 plus applicable taxes. You will also receive 3 free gifts during your subscription. By subscribing, you authorize us to retain your payment information and charge all future shipments until you cancel your subscription. There are no minimum purchase requirements or duration of subscription to cancel. You may call customer service at 800-261-6898 to cancel, suspend or change frequency of shipments. As always, your satisfaction is guaranteed. If any item doesn’t meet your expectations, you may return it at your expense within 30 days for refund of the purchase price less shipping and handling. 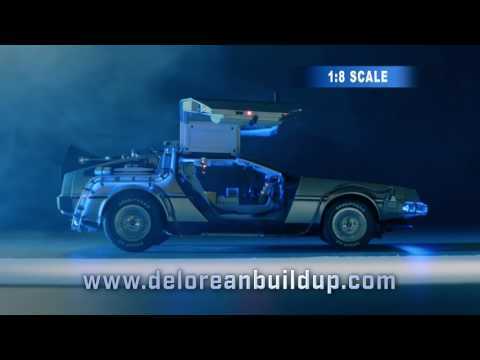 Build the iconic 80’s time machine in 1:8 scale! Keep your magazine in pristine condition in this collector's binder, exclusive to this collection. It holds up to 16 issues. 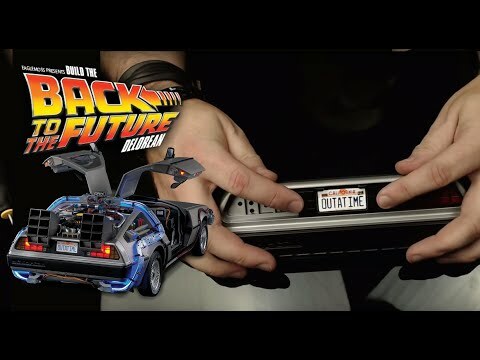 A perfectly designed and embossed tin-plate replica of the iconic OUTATIME license plate perfect to display at home or in your car! 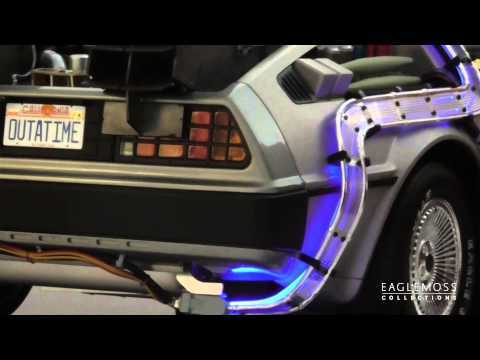 This 1:8 scale model is incredibly detailed and has been made under the supervision of Joe Walser, the world expert on the DeLorean time machine. It’s packed with tiny details including cables, lights in the ceiling, the flux capacitor, time circuits and much more. Back to the Future DeLorean Buildup is officially licensed and authorized for sale by NBC Universal Studies. With each set of parts you will receive a highly illustrated, full-colour magazine with detailed assembly instructions and fascinating behind the scenes facts about both the car and the movie. Click the bottom or top corner to turn the page! The magazine also includes new interviews with the people who made the movie happen and rare production artwork from legendary concept artists Ron Cobb and Andy Probert and writer/producer Bob Gale’s own memories about how the story evolved. More stories from the production team about the making of the movie and detailed descriptions of the evolution of that car. An epic Back to the Future overview with essential facts and figures about all aspects of the movie. The interior of the cabin features a light up version of the flux capacitor, folding seats, and numerous lightsIt’s packed with tiny details including cables, lights in the ceiling, the flux capacitor, time circuits and much more. The time circuits light up and are pre-set with the all important dates from the first movie. Most of the lights are controlled by a series of switches on the central console, just as they were in the film. You can opt to change the nuclear reactor out for the futuristic Mr. Fusion version. The model is a scale replica of Doc Brown’s DeLorean time machine from the Back to the Future trilogy. It is 1:8 scale, and is principally constructed of die-cast metal. All Doc’s modifications have been carefully recreated from the nuclear reactor to the cables on the floor, and the model has a wealth of lights. You even have the option to build the versions that appeared in the sequels. The side windows can be wound up or down, using a small wheel on the underside of the door. The brake lights at the rear of the car come on when you press down on the brake pedal. DeLoreans have lights on the sides of the gull-wing doors and one inside the bonnet, which illuminates the luggage compartment. The wheels can be tiled to create the version of the car that flies in Back to the Future II. Subscribe risk free to start building your DeLorean for only $1.95 + FREE SHIPPING. Get exclusive subscriber gifts valued over $95 when you subscribe. Order today and receive the first two issues to begin your DeLorean Build for only $1.95 with free shipping and handling. After you receive your introductory package, you will receive 4 new issues containing parts and magazines every month to continue building your DeLorean. You will automatically be charged only $10.90 per issue. Shipping and handling is just $1.95 per issue. You will also receive 3 fantastic free gifts during your subscription. Free gifts are special items that you receive for free as a "thank you" for continuing your subscription program. As long as you are an active subscriber you will be eligible to receive free gifts during the course of your subscription. You may also receive special subscriber-only offers and shipments of selected items to compliment your collection. You’ll receive details and pricing in advance so you can tell us if you don’t wish to receive these. 2018 © Universal Studios. Back to the Futures is a trademark and copyright of Universal Studios and U-Drive joint venture. All rights reserved.